DELICIOUS: (From left) So, Hii, Tiong, Wong, and Chieng visit one of the stalls at the night market. SIBU: Butterfly Garden at Cross Road is now beaming with stalls, barbeque smoke, people and tourists, with the market starting its first night of operation on Monday. Noise from the shouts of hawkers, traffic, public and music from the stalls and shop operators now liven up the once dark and cold place. Unlike the previous night market at High Street, Butterfly Garden is brightly lit, though a little bit more crowded. Though different, the fragrance from the local delicacies and the smiling faces of the friendly hawkers make the place a familiar site for the locals. It is still a favourite place for them to buy local food, night snacks, cheap clothes and so forth. BUSY PLACE: The night market at Butterfly Garden. Leaving an old place is not always an easy move, let alone leaving the 40 years of history at the High Street. 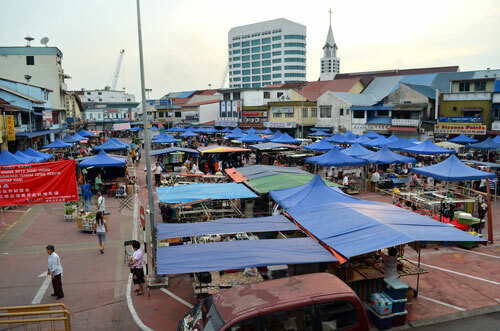 Sibu Night Market Petty Traders Association chairman Sia Puong Sing said they preferred the old site. He said although the first day of operation at the new site was a bit messy, they were willing to cooperate with the council to improve. “We talked with the council about this, and they promised to improve,” he said. HOT HOT HOT! : A hawker is busy doing his business at the night market. Despite the problem, it was business as usual when everything was in place. Walking around the new site, it seemed that people were quite contented with the new place after all. “This is really bright, I like this,” a member of the public said. Sibu Municipal Council (SMC) chairman Datuk Tiong Thai King took a stroll there on the first night to see how things went. 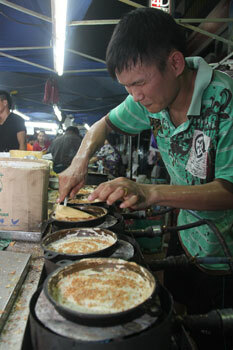 The nostalgia of the old night market was probably still there, Tiong said. “This place is definitely different from the old; the feeling, everything. Some of the hawkers might not have confidence in this new place but I really hope that they would come and see, I am confident they can make business here, just like in the old place,” he added. 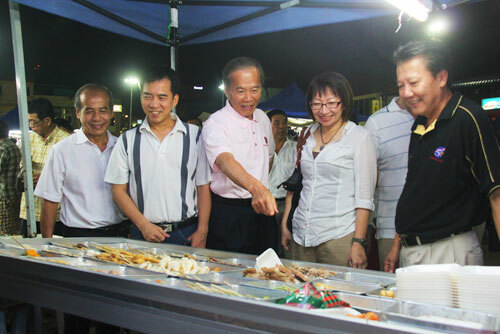 He also called for support from the public to make business at the new night market site a success. Tiong was with his deputy chairman Daniel Ngieng, secretary Hii Chang Kee, Market and Petty Traders standing committee chairman Chieng Buong Toon, vice chairman Wong Hie Ping and member So Teck Kee. He assured that SMC would rectify problems they might have overlooked during the planning stage. Chieng, on the other hand, said he appreciated the cooperation of the hawkers with the council. “The unloading of stuff went quite smoothly. We were a bit worried that there might be some congestion during unloading but we did not see that problem, so that was a relief,” he said. He said the hawkers started to do unloading at 4.15pm and completed the task around 5.30pm. The only complaint they received from the hawkers so far, he said, was on the wiring but assured that the council would install additional pillars to solve the problem. Chieng observed that although many cars were parked along Island Road there was no sign of congestion. “Traffic situation in the vicinity is apparently smoother than expected,” he said. 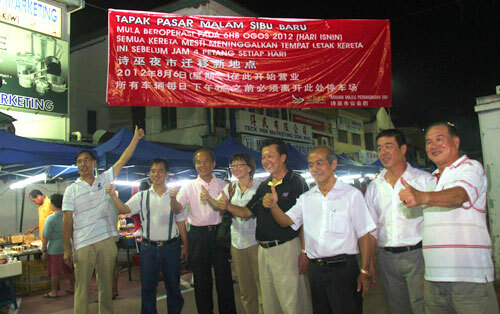 THUMBS-UP: (From left) Ngieng, Hii, Tiong, Wong, Chieng, So and others at the new night market site in Butterfly Garden.